The summer bugs are arriving on all our area rivers. The water is dropping and the fishing is fine. It doesn’t matter which river you chose this week, they are all fishing very well! Green Drakes continue on the Big Wood and the Upper Lost River. The first signs of the Trico Spinner Falls are beginning. The Salmon Fly and an abundance of Stoneflies are showing up all over the place. Baby Hoppers have hatched and are growing quickly. Essentially if the water is low enough to fish, it should fish well. Silver Creek is starting to see Trico action, and with the heat building this week the Spinner Falls should really ramp up. The Callibaetis action should also come on strong. Check the slow water sections for the most action including Sullivan’s Slough and Kilpatrick Pond. Damsel Flies are a sure bet with the heat and as the aquatic vegetation comes up this action will only get better. Be sure to have small Hopper patterns as they begin to grow quickly into adults. Hopefully the river comes up some on the lower stretches to provide the cut bank habitat fish love when eating Hoppers. The aquifer normally provides an influx of water by August, so don’t panic if the lower river doesn’t have the volume you expect. Regardless of the levels the all-day fishing means that there isn’t a bad time to fish the Creek. Morning, noon and night should all produce some excellent opportunities. The Big Wood and Upper Lost Rivers are really shaping up and really fishing well. Large attractors are a great bet. The Green Drakes are well up into the river system and the Stonefly action is peaking as well. If you want to fish a dropper fly, try the Epoxy Back Green Drake Nymph or a Prince Nymph. Fish the riffles and eddies, and once the current speeds slow, be sure to try the foam lines. 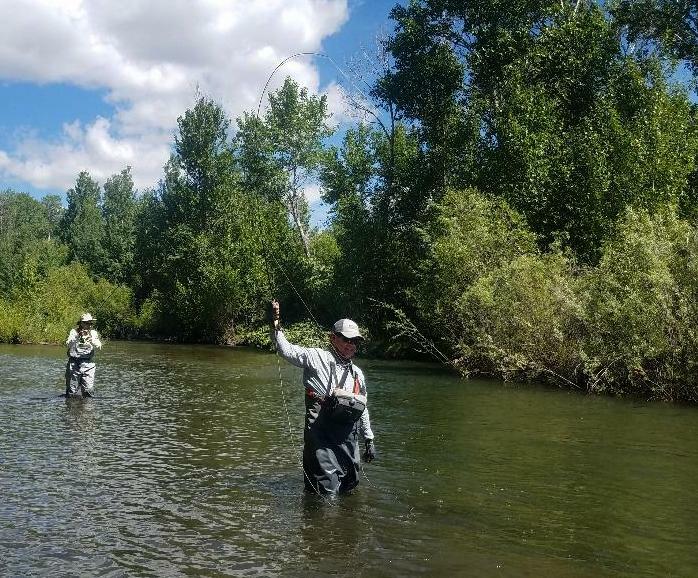 The South Fork of the Boise is still seeing an influx of the Mormon Cricket, but it is also seeing the Salmon Fly hatch as the action moves further and further up the river. With this week’s heat up the action should get very intense, very fast! Enjoy yourselves this week. The rivers may be busier than what the norm is, so everyone be kind to one another and treat your fellow angler how you’d like to be treated!